Clan Badge: An ear of rye proper. The barony of Auchinleck is in Ayrshire, and in 1300 the Laird of Auchinleck is reputed to have followed Sir William Wallace to Glasgow where he fought and slew the Northumbrian Earl Percy. John of Aghelek, otherwise Achinfleck, is the 1st recorded of the Angus family of the name and did homage in 1306. The origin of the name is probably descriptive of their lands ie 'auchen' seems to be applied to areas of high land separating areas of water, while 'lech' may indicate dead in the sense of barren or sterile. The Angus Auchinlecks held the office of Hereditary armour bearers to the Earls of Crawford and lived in the tower known as Affleck near the village of Monikie. The tower passed out of the family hands but still stands to this day. 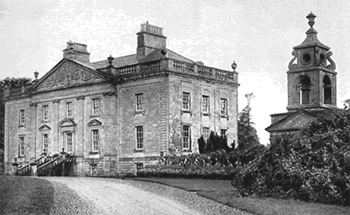 The family married into the distinguished family of Boswell, through one of the daughter of Sir John Auchinleck of that Ilk, and adopted the style 'of Auchinleck'. James Boswell the famous biographer of Samuel Johnson, was a member of this family. General Sir Claude Auchinleck was commander in chief in India in 1941 when Winston Churchill assigned him to lead the Allied offensive in the western desert of Egypt and India. He led the British Eighth Army at the first Battle of El Alamein in 1942. The battle was indecisive and Auchinleck was replaced by Field Marshal Montgomery. Arms: Argent, three bars sable. Crest: An ear of rye proper.